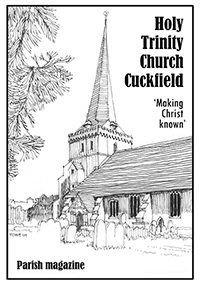 First issued in September 1861, Cuckfield Parish Magazine is published monthly, except January, and contains items of both church and general local interest. The December issue of the magazine is distributed free of charge to every household in the parish. An annual subscription to the paper version of the magazine, which is delivered locally, is just £5.00 and can be arranged through the Church Office. The magazine, which is published on the last Sunday of each month, is normally 42 pages in length, including community advertisements, and is edited, printed and collated in-house.